We, the Jews, also do not surrender, nor can we surrender, our rights to the historic holdings of our forefathers in Hebron, Shilo, and Anatot. But the majority of Israelis are willing to relinquish the right to realize Jewish sovereignty and Jewish settlement at those Biblical sites, in proportion to Palestinian concessions. The vast majority of Palestinians are clearly aware that it is impossible for millions of refugees to return to their homes and land in Jaffa, Ramle, and Haifa. There are several things wrong with this far too-clever formulation. For one, it is irrational to tell someone that he has a right to something, but in the same breath that he is forbidden from realizing it. What is the meaning of ‘right’ in this case? Here in the United States there was a situation for many years in which blacks had the ‘right’ to vote, but were forbidden from exercising this right. People struggled and even gave their lives so that these rights could be realized, and ultimately they were. Another problem is that granting this ‘right’, whether or not it is realized, implies that the Palestinian narrative that the land of Israel belongs to them, not to the present residents, is true. Is constitutes an admission that Jews do not have the ‘right’ to live there. Are we prepared to say “we are thieves, but the true owners are forbidden to take back their property?” Do we believe this? And from a practical point of view: once we agree that they have a right to return, what argument do we use to prevent them from returning? “It would destroy the Jewish character of the state” might be meaningful to us, but who else would accept it? And why should they? Indeed, this ‘compromise’ is not a compromise, it is a complete surrender in principle with the proviso that the physical surrender will take place at some later date. Although Danny Rubinstein — who called Israel an ‘apartheid state’ at a UN conference in Brussels — is a particularly loose cannon, this idea has appeared in other circles as well. It is to be hoped that Israeli leaders do not adopt this as a way to deal with Palestinian demands for a right of return at the November peace conference. They should make it quite clear that Jews live in Israel with full legitimacy and ownership of the land that they live on, and that there is no Palestinian ‘right of return’, realizable or otherwise. Are we really as stupid as we seem? Fatah will fight alongside Hamas if and when the IDF launches a military operation in the Gaza Strip, a senior Fatah official in Gaza City said Thursday. According to…reports, Saudi Arabia and Egypt have decided to invite representatives of Fatah and Hamas for talks on ways of ending their power struggle. Meanwhile, the German Foreign Minister suggests that Europe should send aid to Mahmoud Abbas’ Fatah faction, the Israeli government [!] has approved sending Russian armored personnel carriers, rifles and ammunation to Abbas, and Israel plans to release 400 Fatah security prisoners this Sunday. No, Israel has not said that they will teach them to drive the APCs. That will probably be the job of US Generals James Jones and Keith Dayton, whose job is to ‘coordinate security’ and build up the Fatah faction’s ability to ‘fight terror’. Last week, terrorists of Fatah’s al-Aqsa brigades murdered Israeli Ido Zoltan. Not Hamas. Fatah. So they don’t agree to recognize Israel’s identity as a Jewish state, they plan to cooperate with Hamas — although they have supposedly agreed with the ‘roadmap’ that they will disarm and dismantle terrorist groups — and they can’t or won’t control their own terrorists. Partner…or enemy? It should be 100% clear by now, to the US, Europe, and Israel, that Fatah’s moderation is only wishful thinking, and the strategy of building a solution to the conflict on it cannot possibly succeed. Arms supplied to Fatah will be used directly against Israel, as they were in the Oslo period, or they will end up in the hands of Hamas as they did earlier this year. How many times do we need to make the same mistake? I got called “anti-Peace” again recently. But I am not anti-Peace, I very much wish for Peace between Israel and the Arabs so that my children who live in Israel can be safe, so that my son, who has been some form of soldier for the past ten years, can be an artist as he wishes to be. But what I am is anti-‘peace’. What’s the difference? A necessary condition for Peace is that the Arabs have stopped trying to kill Jews and destroy Israel. A 10-year hudna, such as Hamas offers, for example, is not Peace because it is only a particular tactic in the struggle; the goal remains the same. Peace is more or less what Israel has with Jordan today. And what is ‘peace’? ‘Peace’ is a situation in which Israel and the Arabs have signed an agreement which states that both sides want Peace and spells out what they will do to get it, but which is either impossible to implement or which one or both sides intends to circumvent. The Oslo Accord is a good example of ‘peace’. Papers were signed, concessions were made, but Yasser Arafat never wanted Peace, never held up his end of the agreements, and ultimately made war. Some Israelis said from the beginning that Oslo was only ‘peace’, but most thought it would lead to Peace and were bitterly disappointed. Most ordinary people, Israelis and Palestinians, probably want Peace, although some other things that they want are incompatible. But who wants ‘peace’? The US wants ‘peace’. The Bush Administration wants it because an agreement will make them look good in history and because they think that they can get Syria to stop supporting Iraqi insurgents by forcing Israel to give them the Golan Heights. The US State Department wants ‘peace’ because it is basically pro-Arab and knows that ‘peace’ will weaken Israel and make the Saudis happy. Mahmoud Abbas wants ‘peace’, because it will mean more aid from the US and Europe for him, and because it will weaken Israel and serve as a stage on the way to replacing Israel with an Arab state. Hamas and Syria want neither Peace nor ‘peace’. They do not want to help Abbas or the US. Hamas’ constituency will not accept even ‘peace’. Syria does not want ‘peace’, because ‘peace’ would (as Barry Rubin argues in The Truth About Syria) remove the excuse used by the Assad regime to oppress its population, drain the economy, and exploit Lebanon. Assad would much prefer the status quo without the Golan Heights to an agreement that would make him give up his influence in Lebanon. The Israeli government is in an interesting position. Although Oslo taught them the difference between Peace and ‘peace’, ‘peace’ is very important to the Americans who are important to Israel. The international media, the UN and NGOs, the EU, Tony Blair, etc. — they all seem to think (or pretend) that ‘peace’ is Peace. So the PM and the Foreign Minister need to pretend that they think ‘peace’ is Peace and are enthusiastic about it — otherwise they will be called “anti-Peace”. It’s not a problem for me. Leaving aside the question of the more than 1 million Palestinians who live in Hamas-run Gaza, what has changed since 2000 to make this possible? Has Israel’s attitude changed toward the Palestinian demand, not softened by Abbas, to resettle the descendants of Palestinian refugees in Israel? Have the Palestinians indicated that they would be prepared to accept any less of Jerusalem than all of the areas formerly occupied by Jordan? Will they allow Israeli sovereignty over the Temple Mount? Have the Saudis, billed as the stars of the upcoming conference, given us any reason to believe that the Arab League proposal on which this conference is supposedly based will offer Israel anything other than terms of surrender? Does Syria, which the US wishes to invite to the conference, have any more desire to end the conflict with Israel than in the past (see Barry Rubin’s opinion here)? The United States will not be able to achieve its goals in the Middle East unless the United States deals directly with the Arab-Israeli conflict. There must be a renewed and sustained commitment by the United States to a comprehensive Arab-Israeli peace on all fronts: Lebanon, Syria, and President Bush’s June 2002 commitment to a two-state solution for Israel and Palestine. This commitment must include direct talks with, by, and between Israel, Lebanon, Palestinians (those who accept Israel’s right to exist), and particularly Syria—which is the principal transit point for shipments of weapons to Hezbollah, and which supports radical Palestinian groups. I’ve argued that this ‘linkage’ idea is nonsense. Unfortunately, the US State Department doesn’t agree with me, and so is moving ahead with its plan to trade its only reliable ally in the Mideast for probably worthless promises from the Arab nations. Imprisoned Fatah boss Marwan Barghouti will become the Palestinians’ next leader, Infrastructure Minister Benjamin Ben-Eliezer recently told Haaretz. …Ben-Eliezer said that he believed that “there is no reason to become alarmed” by the possibility that Barghouti will be released from the Israeli prison system, where he is serving five consecutive life sentences for terrorist activities. In case anyone is unclear, the ‘activities’ mentioned were the murders of four Israelis and a Greek monk. Barghouti is the author of the “prisoners’ document” which is touted as a charter for a moderate Palestinian Authority, but actually simply calls for unity between Fatah and Hamas in the struggle with Israel, and does not call for an end to violence against Israelis. This comes up every few months, usually when some Labor MK calls for his release. Apparently there is a point of view that any ‘peace’ agreement with the Palestinians, even a bad one that cannot result in peace, even an agreement with a Palestinian leader such as Barghouti with gallons of Jewish blood on his hands, is better than no agreement. Ben-Eliezer says over the past months he had realized Barghouti is probably the best partner Israel has with whom it can hope to achieve a breakthrough in negotiations with the Palestinians. Indeed. There is no better partner because there is no reasonable partner, but the idea, possibly born in the USA, is that — partner or not — an agreement must be reached. 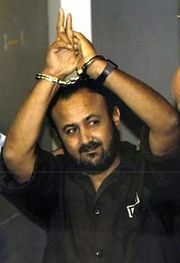 According to Ben-Eliezer, Barghouti enjoys considerable sway over the situation in Palestinian Authority from within the Hadarim prison facility. The minister says Barghouti’s pull extends to the preparations for the U.S.-sponsored regional peace summit Washington intends to hold in November. That’s it, then. The Americans say there must be a ‘summit’ (somehow, and I shudder to speculate how, this is supposed to help with Iraq) and there must be an agreement, regardless of the consequences. The Palestinians, understanding this, will not play unless they get what they want, and this is one of the things they want. “We have to find a suitable opportunity to release Barghouti, and we have to link it to the release of Gilad Shalit,” the minister said. It’s not possible to release a quintuple murderer in return for a hostage. Israel needs to apply the death penalty to terrorist murders to prevent such situations.